lagreeny is committed to building a strong community and working together with our clients to help them meet their fitness goals. 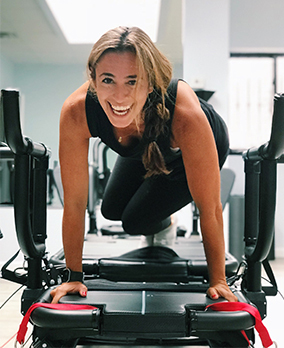 We guarantee a balanced and intense full body 50-minute workout that will utilize the megaformer’s unique design and Lagree methodology to target and burn out the muscles effectively. Our passionate Level 1 and Level 2 Certified Lagree Instructors will provide a deeper knowledge of the body and the space for clients to have a supportive and encouraging experience. The Lagree Fitness Method is a high intensity, low impact workout performed on the evolutionary Megaformer. Lagree is the most innovative full body conditioning fitness model. It is intense on the muscles yet safe on the joints, spine and connective tissues. Lagree effectively combines strength, cardio, endurance, balance, core and flexibility training in each exercise. The movements performed are slow and controlled which activate the slow twitch muscle fibers also known as your fat burning and endurance muscles. This workout is suited for both men and women regardless of fitness level. Get ready to plank, lunge and torch some serious calories. Classes are only 50 minutes long. You don’t need more time, you just need more intensity! The megaformer uses balance and resistance to reach effective muscle stimulation and push your muscles to ultimate exertion. It consists of 2 stationary platforms, a moving carriage, springs for resistance, handlebars, straps and cables. Each exercise will run seamlessly into the next and will get your blood pumping and elevate your heart rate. The Megaformer attacks each muscle in a very concentrated manner to sculpt strong, lean and powerful bodies. The combination of a moving carriage and weighted springs will create continuous tension allowing for maximum intensity and constant engagement of your core.